Auto accidents are covered 100% by your insurance. We will help you through this process at no up front cost to you. 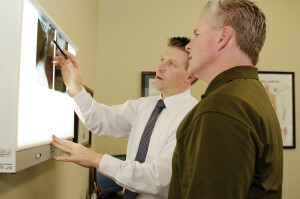 In our office we specialize in injuries caused from auto accidents. We know how to get you out of pain fast and prevent any future pain. After a car accident comes the added stress of dealing with the insurance company, being without a car, and suffering from personal injury. If you are like most people, your health will take a backseat to getting your car fixed. I often hear “I thought the pain would go away.” Well the problem is that it may not go away. If you or someone you know has been injured in an auto accident tell them about our FREE Injury Evaluation. Help prevent auto accidents by avoiding distractions, drive the speed for the current weather conditions, and wear your seat belt. Drive Safely!